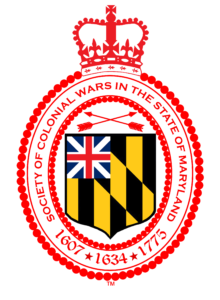 The General Society of Colonial Wars is an historical genealogical, educational and social organization with constituent societies in 30 states, including Maryland, as well as the District of Columbia and the British Isles. It was instituted to perpetuate the memory of those events in American Colonial history which took place within the period May 13, 1607 to April 19, 1775. 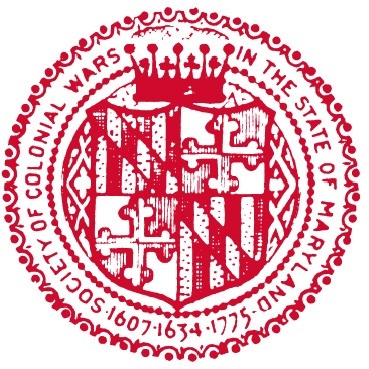 The Society of Colonial Wars in the State of Maryland was incorporated on March 1, 1893. It’s constitution and bylaws were adopted on March 26, 1910. In keeping with its mission, the Maryland society assists in collecting and preserving historical documents and records contributing to the archives of libraries, universities and historical organizations. In addition, it provides financial assistance toward maintenance of colonial-era sites and buildings, provides stipends to students pursuing graduate studies in colonial history, and erects memorials and markers relating to the American colonial period.